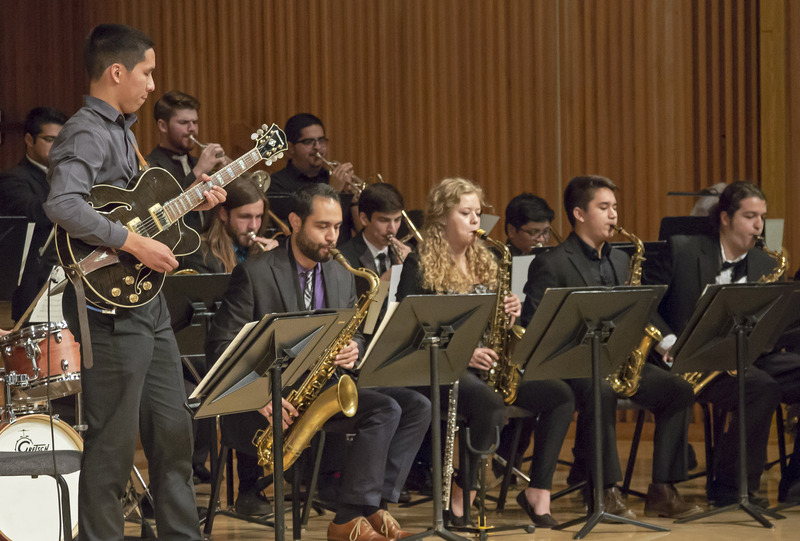 Keeping alive a run of consecutive appearances that began in 2007, Sacramento State’s Jazz Ensemble has accepted an invitation to play and compete at the prestigious Monterey Next Generation Jazz Festival, March 9-11. Joining the group this time will be a student jazz combo from the School of Music’s. It is only the second time such a group from Sac State has made the finals. The combo heading to Monterey comprises Elias Lucero, guitar; Brendan Sick, alto saxophone; Sean Nelson, drums; and Alex Reiff, bass. Each year festival officials receive submitted songs from universities across the nation, choosing just six ensembles and combos to perform. The top performer at the March event will be invited back to perform at the renowned Monterey Jazz Festival, Sept. 21-23. The ensemble’s program for Monterey includes “Kite,” a Snarky Puppy tune commissioned for the ensemble by award-winning composer James Miley; “Little Vikings,” arranged by former jazz ensemble member Levi Saelua; and “Vital Frequencies,” an up-tempo swing tune by Ben Patterson. The combo’s set includes Cedar Walton’s “Firm Roots,” Alex Reiff’s “You Disgust Me,” and Stevie Wonder’s “Sir Duke,” arranged by Joe Gilman. The ensemble will show off its award-winning chops for Sacramento jazz fans when it performs during Sac State’s Festival of the Arts. The performance is scheduled for 8 p.m. Friday, April 13, in the Capistrano Concert Hall on campus. The concert will include a guest performance by trumpeter and educator Dave Douglas.